What Are The Best LED Bulbs For A Garage Door Opener? LED bulbs are all the rage these days and putting them on garage door openers is a popular idea as well. The real question is which ones are the best for a garage door opener? There are so many to choose from. You might even get a colorful idea and use a red or a blue one for certain holidays, or just in general. Which raises another important question. Can you do that? After all, some light bulbs do tend to get hotter than others. Some bulbs use more electricity than others. There are several different types of lighting with LED bulbs. Most of that is determined by different wattage levels of the bulbs. You might just want to know what’s in style with LED bulbs for garage door openers. Well, we are going to answer all of those questions to the best of our ability, today! What LED Bulb Wattage Is Safe? 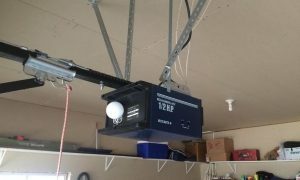 Your garage door opener is an expensive piece of equipment and you don’t want it to have electrical problems because you used the wrong light bulb. It is very important to note that different garage door openers can only use brands and LED bulb models that are specific to them. That is number one. Number two is that most of them use a bulb between forty and sixty watts. This is the case with most garage door openers but it doesn’t hurt to find your garage door opener manual and double check it. That is pretty much the case with anything relating to your garage door opener. Don’t cost yourself money by trying to figure it out without doing some research. 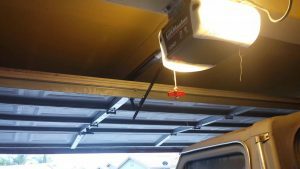 Can A Colored LED Be Used In A Garage Door Opener? Absolutely! Just as long as it falls into line with the specs required by your garage door opener. Just remember to use a color that actually illuminates your garage at night. That is the entire point of the light in your garage door opener. A pretty color isn’t going to stop you from tripping over something in the dark. What Are The Advantages To Using An LED Bulb? Well first, your garage door opener is going to be used a lot. You have to figure that the light on most garage door openers comes on even during the day. That is using a decent amount of extra electricity that contributes to each electric bill. You can lessen that by using an LED bulb in your garage door opener. They also last a lot longer than old-school light bulbs. Most LED bulbs are good for a few years more than those old bulbs. LED bulbs also create considerably less heat and have no warm-up time. They light right up so you can see without the lighting playing with your vision. 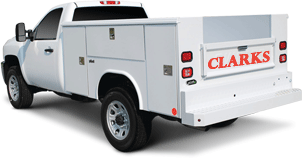 Just call Call (877) 622-8183 and Clarks Garage Door & Gate Repair will take care of all your garage door opener needs. Clarks Garage Door & Gate Repair provides Garage Door Repair and New Garage Door Installation services as well.